Primele camioane echipate cu motoare alimentate cu GPL au fost livrate de Mercedes-Benz companiei de supermarket-uri ALDI SÜD. In Germania autovehiculele alimentate cu GPL sunt scutite de o parte de taxe, in plus transportatorii se bucura si de o economie consistenta rezultata din pretul mai mic al gazului lichefiat. Mercedes-Benz Econic sunt echipate cu motoare silentioase si o cutie de viteze cu sase rapoarte. Vehiculul din imaginea de mai jos este un semi-trailer cu acoperis inalt si incinta frigorifica. Mai multe in comunicatul de presa atasat. Mönchengladbach/ Wörth – The first Mercedes-Benz Econic with NGT (Natural Gas Technology) for food distribution operations has been handed over to the ALDI SÜD group of companies in Mönchengladbach. The vehicle is a semitrailer tractor with a high roof and a refrigerated semitrailer. To honour its environment tal responsibilities in the areas of procurement and distribution, ALDI SÜD decided in favour of an environmentally friendly natural gas engine – this is now being put to the test with this vehicle. 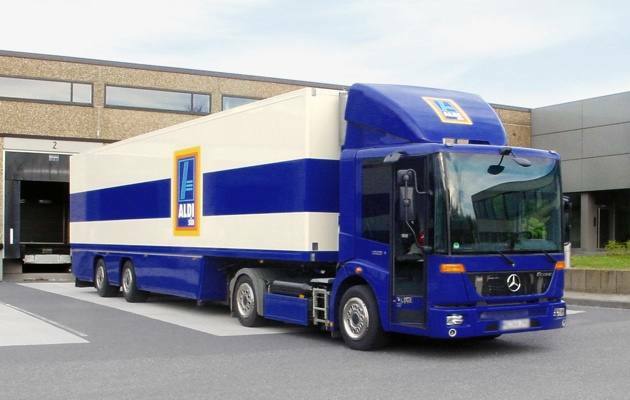 ALDI SÜD uses the new Mercedes-Benz Econic NGT to supply its branches on the left bank of the Lower Rhine from the central warehouse in Mönchengladbach. Traffic-calming zones, narrow entrances, illegally parked cars, increasing environmental regulations and access restrictions – as well as enormous time pressure – mean that city logistics make heavy demands on both the driver and vehicle. A modern distribution vehicle must therefore meet high requirements with respect to load capacity, manoeuvrability, environmental compatibility and economy. Lower CO2 emissions versus comparable, diesel powered vehicles, CO2-neutral operation when biogas is used as a fuel, zero particulate emissions and a low noise level – all these are the ecological benefits of the Econic NGT. Power is transferred by a six-speed automatic transmission. The vehicle meets the stringent EEV emission standard (Enhanced Environmentally Friendly Vehicle), and is therefore entitled to bear the „Blue Angel” environmental emblem. Trebuia sa zici acolo ca vor sa faca mai multi bani si s-au gandit sa mai taie din costuri.